The end of the year is also the last day of the Continuing Professional Development (CPD) year. The Enhanced CPD scheme was introduced this year which has seen the implementation of new CPD regulations. Under the ECPD scheme, dentists will need to complete a minimum of 100 hours verifiable CPD over their five year cycle as well as ensuring they declare at least 10 hours during any two year period.​ It is important to remind all dentists that any CPD done after the 31 December 2018 will not count towards the previous year. Three national dental organisations are supporting the World Health Organisation’s World Antibiotic Awareness Week by urging the dental profession to help keep antibiotics working. The Faculty of General Dental Practice (FGDP(UK)), the British Association of Oral Surgeons (BAOS) and the Association of Clinical Oral Microbiologists (ACOM) say that while progress has been made in reducing the number of antibiotic prescriptions in dentistry, more needs to be done to further reduce inappropriate prescribing. Antimicrobial resistance (AMR) is a worldwide problem, with the emergence of bacteria that are resistant to many classes of antibiotics constituting a major threat to public health as even simple infections may become untreatable. Inappropriate prescribing and misuse of antibiotics contribute to an increasing incidence of multi-drug-resistant infections, causing an estimated 700,000 deaths each year, including 25,000 in Europe. The health care gains for patients undergoing major surgery, and a wide range of critical treatments such as organ and stem cell transplants and chemotherapy, will be lost to the higher risk of mortality, and the UK government predicts the annual global toll could be 10 million by 2050. Dentists issue approximately 5-7% of all antibiotic prescriptions in the NHS, and the three organisations are encouraging dental prescribers to use freely available resources to help ensure appropriate use. FGDP(UK)’s Antimicrobial Prescribing for General Dental Practitioners is available on the Faculty’s website, and provides evidence-based guidance on when to prescribe antibiotics, what to prescribe, for how long and at what dosage. The BAOS’s recently-launched Antimicrobial Stewardship (AMS) e-Learning Modules provide verified CPD enabling oral health professionals to demonstrate application of the principles of antimicrobial stewardship to common clinical scenarios. They are relevant to all GDPs, including those who place dental implants, undertake minor oral surgery or practise in specialist areas. The FGDP(UK), BAOS and ACOM also highlight the free Dental AMS Toolkit, which is endorsed by Public Health England and available on the FGDP(UK) website at www.fgdp.org.uk/antimicrobial-prescribing. The toolkit includes patient information on the use of antibiotics for the management of dental infections, as well as the Antimicrobial Prescribing Self-Audit Tool which enables dental prescribers to audit their antimicrobial prescribing and management of dental infections against guidelines. The profession is also encouraged to take the dental pledges at http://antibioticguardian.com/, and to use the hashtags #AntibioticGuardian and #keepantibioticsworking on social media. World Antibiotic Awareness Week is a joint initiative of the UN’s World Health Organisation, Food and Agriculture Organisation, and World Organisation for Animal Health. It runs until Sunday 18 November, which is also European Antibiotic Awareness Day, organised by the EU’s European Centre for Disease Control. Group Captain Mark Richardson, Vice-Dean of the Faculty of General Dental Practice UK (FGDP(UK)), has been appointed Her Majesty The Queen’s Honorary Dental Surgeon. 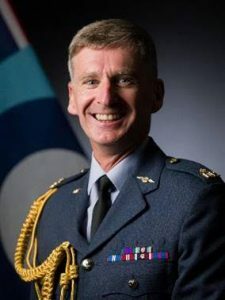 The honour follows his recent promotion to Chief Dental Officer of the Royal Air Force (RAF), and caps off a successful year in which he was also elected to the Faculty Vice-Deanship. Two Queen’s Honorary Dental Surgeons are appointed from each of the three Armed Services, and while the role is honorary, they assume responsibility, on a rotation with the Queen’s Honorary Surgeons, Physicians and Nurses, for medical arrangements at Investitures at Buckingham Palace, Windsor Castle or the Palace of Holyroodhouse. Mark joined the RAF in 1989 shortly after graduating from Dundee University, and has served as a dental officer in Afghanistan, Europe, the Far East and the UK. Based in Tidworth, Wiltshire, he is currently the Armed Forces’ Principal Dental Officer for Wessex Region, responsible for clinical delivery, governance and quality assurance across 16 tri-service dental centres which look after the oral health of around 30,000 service personnel. He is also the Armed Forces’ Clinical Adviser on Paedodontic Dentistry, in which he holds an MSc. A holder of FGDP(UK)’s MGDS qualification, he became an examiner for the MFGDP in 2007 and then a Core Group MJDF examiner in 2013. He has been the elected Board Member for the Wessex and Oxford region since 2016, and is also a Facilitator for FGDP(UK) Fellowship. He is also a Fellow both of the Faculty of Dental Surgery of the Royal College of Physicians and Surgeons of Glasgow, and of the Faculty of Dental Trainers at the Royal College of Surgeons of Edinburgh, where he recently became an examiner for the Membership in Advanced General Dental Surgery. He also holds an MSc in Medical Education and is a CQC Specialist Advisor. “Mark’s appointments as CDO (RAF) and Queen’s Honorary Dental Surgeon are fitting recognition for a career dedicated to the delivery of exceptional care for an exceptional patient population, as well as his broader contribution to continuing excellence in training”. ADAM and specialist dental accountants Hazlewoods are working in partnership to produce their annual survey looking at current pay rates. The aim is to gain a better understanding of current rates of pay within the dental sector and provide participants with a benchmark against others in their region. One lucky respondent will win an iPad and one year’s subscription to ADAM. To be entered into the prize draw your survey must be received by 30 November 2018. DPAS Dental Plans has welcomed a new member to the team, with Leanne Rose joining them as a Business Development Consultant. Leanne, has six years’ experience in NHS and private practices with roles including Dental Nurse, Treatment Coordinator and Practice Manager. She has a wealth of practical experience in building the online presence of practices, increasing the number of patients on plan and training staff on the patient journey. She has joined DPAS’s team of Business Development Consultants who are dedicated to providing personal support, training and encouragement to help practices grow their patient numbers. Leanne, who is covering the North West region, said, “I am passionate about using my experience in dentistry to help practices grow their plan numbers and create a solid foundation to further build their business. “I’m already beginning to feel like an extended member of the practices’ teams, and with my background I can relate to the challenges and opportunities they’re facing as I have been in the same situations so can share advice I know works. The Faculty of General Dental Practice UK (FGDP(UK)) has responded sceptically to proposals to cut costs by amalgamating the UKs health regulators. In response to a consultation by the Department of Health, it says it is not convinced that combining dental regulation with that of other professions could save money while retaining the required understanding of the dental professions, and that in the absence of evidence to the contrary, the interests of patients and the profession will best be served by the continued existence of a regulator dedicated solely to dentistry. The Faculty says that decisions on the regulation of health professions should instead be guided by the risk of patient harm, and that as such there can be no optimum number of healthcare regulators. It also suggests that as the UK has over 70 regulators, including four for social care, and six each for legal services, financial services and privatised utilities nine regulators for healthcare, covering 1.5 million professionals in 32 occupations, does not appear excessive. FGDP(UK) also expresses concern over proposals to create a single adjudication body for fitness to practise, a single register of all health professionals, and a single set of standards in lieu of profession-specific ones, and rejects the suggested use of mediation in regulatory proceedings and proposals for employers to be represented on the General Dental Council (GDC). However, FGDP(UK) agreed that the currently statutorily-regulated professions should be reassessed to determine the most appropriate level of oversight, and that the regulator should be accountable to the Scottish Parliament, National Assembly for Wales and Northern Irish Assembly in addition to the UK Parliament. While the GDC itself acknowledges that there are improvements to be made to the way in which it regulates, it has nonetheless developed specialist knowledge of dental patients and the professions that treat them, each of which exhibit characteristics and contextual factors which are not necessarily the same as those of other medical professions and their patients. In an amalgamated regulator, this sector-specific knowledge would either be maintained at additional cost, or, more likely, lost in a drive to harmonise procedures and cut costs. For these reasons, the onus is on the government to produce convincing evidence that its own stated objectives for regulation public protection, performance management, and professional development and support – would not be all the harder to meet if dental regulation were to be amalgamated with that of other professions. One lucky respondent will win an iPad and one year's subscription to ADAM. To be entered into the prize draw your survey must be received by 31 December 2017.